Marvel made a big splash yesterday at D23. The studio promised that they’d bring the goods and as expected, they delivered, showing off the first bit of footage from Joe and Anthony Russo’s Avengers: Infinity War. Unfortunately for those of us at home, they chose not to make it available online, but from the numerous reports pouring out of the convention, it sounds like the superhero extravaganza is going to be the movie to beat next year. Given how positive the reactions to the D23 trailer were, it would seem that the excitement surrounding the upcoming sequel is at an all-time high right now, with fans eager to get their hands on anything and everything from Infinity War, and while we fully expect to see a bit more from Marvel at Comic-Con, we’ve now got a “new” photo to tide you over. Admittedly, it’s not terribly exciting, and it’s already been shared before, but in light of the footage that was shown yesterday during the panel, it’s definitely worth another look – and here’s why. You’ve seen it already, right? The above pic popped up online earlier this year but at that time, it was thought that it was taken from Spider-Man: Homecoming. However, now that Marvel’s shown off some footage from Infinity War, not to mention Homecoming is out in theatres, a number of people are claiming that it’s actually taken from a scene in the next Avengers film, one that featured in the trailer that the studio brought to D23. Again, it’s not the most revealing or exciting shot, but it would appear that this is our first real look at Spider-Man in the upcoming blockbuster. 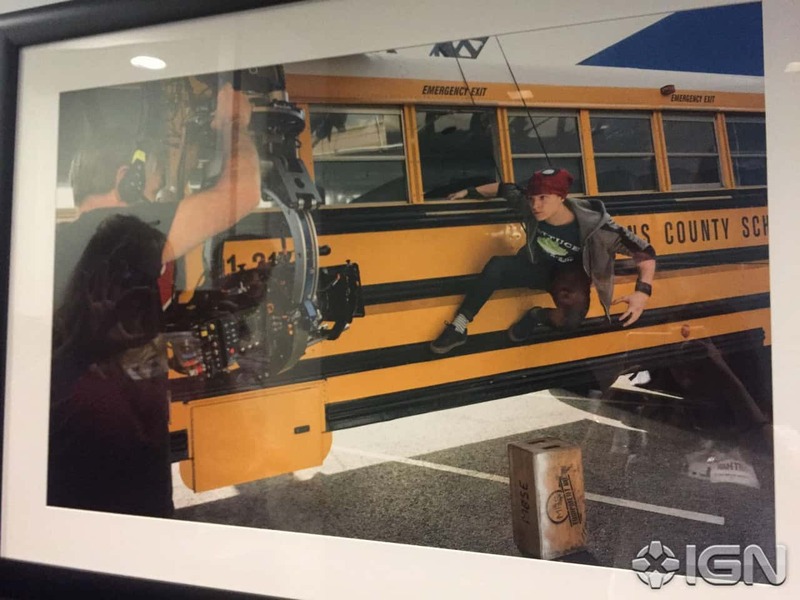 From what we understand, the scene in question sees Spidey climbing aboard the school bus to leap into action and help Earth’s Mightiest Heroes in one of their battles with Thanos. Given that we haven’t seen the trailer for ourselves and it’s not online yet, we can’t say with 100% certainty that this is indeed taken from Avengers: Infinity War, but all the signs do point to that being the case and quite honestly, we have no reason to doubt the reports coming out of D23. Either way, with Comic-Con right around the corner now, we should find out more about what the studio’s got planned in no time at all.